Before you go to a store to buy a reptile, know that there are plenty of animal rescue organizations dedicated to saving these scaly animals. Too many people don’t realize that reptiles aren’t a good fit for their household and they either release them into the wild or simply neglect them. Just like mammals, there are plenty of reptile species to choose from – each with wildly different characteristics and habits. Have you ever owned a reptile before? If not, start with a bearded dragon. Even though they can grow to a maximum of around 23 inches from head to tail, they are tame and docile. They like affection and are easy to handle. 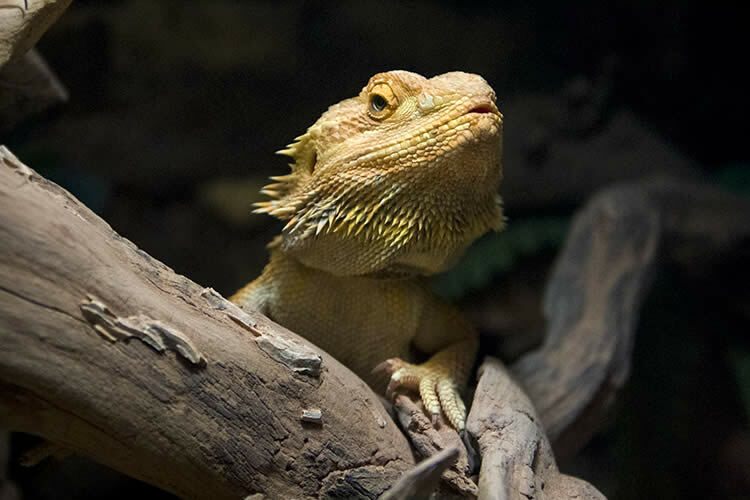 Bearded dragons also have a simple diet – but a drawback is that they require a mixture of insects and plants. As omnivores, feeding them solely a plant-based diet would not be appropriate so you will also need to incorporate live insects into their meals. If you can’t handle the insects, don’t buy a bearded dragon. Most reptiles will require a mixture of plants and live animals in their diets and a bearded dragon’s diet might be much more attractive than that of a snake – which requires live mammals such as mice. Another drawback is that a bearded dragon requires a very large terrarium – at least 35x20x20 inches. This turtle is aquatic but don’t let that scare you. The climate of aquatic tanks is much easier to control than that of terrariums. If you get a red-eared slider as a hatchling, don’t be surprised when it grows into a large adult – about a foot long. Therefore, be prepared to buy a giant tank to house this swimmer. A red-eared slider lives on a mostly herbivorous diet but must have a bit of animal protein mixed in. Fortunately, there are commercially manufactured turtle pellets to provide the extra protein but you can help round out its diet by giving it some fresh fruits and veggies. Not for novices, the iguana has become a pet fad. Unfortunately, people don’t realize what they’re getting into when they buy an iguana hatchling. Not too long after, their cute baby iguana has turned into a seven-foot dragon weighing about 20 pounds. An iguana requires its own room in a house, built as a custom terrarium. Don’t get an iguana if you aren’t willing to do this or if you aren’t willing to share your entire home with it as it matures. While its size is cumbersome, its diet is relatively easy. Iguanas are strictly herbivores. They require plenty of vegetables and the occasional fruit and calcium supplement. Avoid feeding them plants high in protein – this can cause kidney damage. They love dark, leafy greens – such as what they would eat if they were in the wild. If you don’t socialize your iguana properly, it won’t tolerate being handled very well. On the other hand, giving your iguana affection early on will endear it to you – they’ve been known to be quite attached to their families. After handling your reptile, always wash your hands. Some species are known to carry salmonella in their digestive tracts which can contaminate surfaces after they defecate. Keep areas where they travel clean especially if you have young kids around. Reptiles are certainly different from mammals but they still require attention and care from their guardians. If they are to thrive, their homes must be clean and they must be fed a proper diet according to their species. They aren’t as cuddly as a kitten or puppy but they have their own merits as very exotic, beautiful animals with distinct personalities.